Despite more than a century and a half of interest in the study of speciation, questions remain about the relative importance of different mechanisms and forms of reproductive isolation in generating new species. More comprehensive investigations of these alternatives in a wider variety of taxa are needed to fill this gap in understanding. 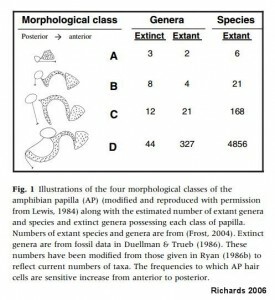 Barriers to gene flow among diverging populations can be prezygotic or postzygotic and previous work has demonstrated the importance of each type of isolation under different models of speciation. While studies of postzygotic mechanisms provide important insight into the genetics of speciation, prezygotic barriers often appear to be critical in keeping populations apart. Sexual signals can play an important role in speciation when the primary cause of prezygotic isolation is parallel changes in mate preference and the trait on which the preference acts, which is often a secondary sexual trait. 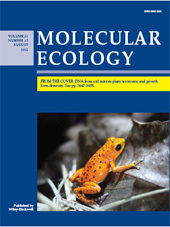 For example, it had been proposed in an often cited study that the evolution of complexity in the amphibian papilla (inner ear organ) represented a key innovation, which led to an increase in anuran speciation rates by extending the range of frequencies over which male mating calls could diverge and still be perceived by the female. Our work refutes this theory, highlighting instead the role of a second auditory organ in the evolution of acoustically-mediated reproductive isolation among anuran species (Richards 2006). Our ongoing research aims to answer two key questions in the field of evolutionary ecology for the highly polymorphic strawberry poison frog (Oophaga. pumilio): (1) which kinds of reproductive barriers are most important in preventing gene flow during speciation, and (2) what are the relative contributions of adaptive processes (i.e., natural and sexual selection) in the formation of those barriers? To answer these questions, we are testing for differences in fitness among color-morphs caused by predation and by female mating preferences, and quantifying their contributions to reproductive isolation. By integrating insights from ecological, behavioral, and breeding studies, we are systematically assessing the contributions of a suite of potential pre- and postzygotic barriers, providing empirical support for theory on the mechanisms of speciation. While the bright colors of O. pumilio likely advertise their toxicity to would-be predators (aposematism), color is also important in mate choice, with females showing preferences for courtship with males of their own color. Thus far, our attention has focused on true polymorphisms, areas where multiple color phenotypes co-exist and interact within the same population, as they provide the clearest picture of the mechanisms by which reproductive isolation may be evolving. 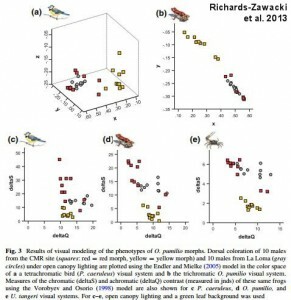 Our work has demonstrated stronger assortative courtship preferences in polymorphic than monomorphic populations (reproductive character displacement: Richards-Zawacki & Cummings 2011), suggesting the potential for premating isolation to evolve in sympatry. Using pedigree data generated from a long-term mark recapture study, we were also able to demonstrate that color-assortative mating (behavioral prezygotic isolation) occurs asymmetrically within a polymorphic population, and provide insight into the genetic architecture of the polymorphism (Richards-Zawacki et al. 2012). While it is still an area of active investigation, to date we have found no evidence for postzygotic isolation (intrinsic, or extrinsic due to predation or mate preferences, Richards-Zawacki et al. 2013, Dugas & Richards-Zawacki 2015). This is surprising given that the frogs’ colors are also thought to be used in an aposematic context and hence, be under intense purifying selection. In the coming years we aim to expand this work to investigate the contributions of additional isolating barriers and develop O. pumilio as model system for understanding the tempo and mode by which reproductive isolation evolves.